During July–August 2008, a salvage excavation was conducted in the Zipor compound in Modi‘in (Permit No. A-5480; map ref. 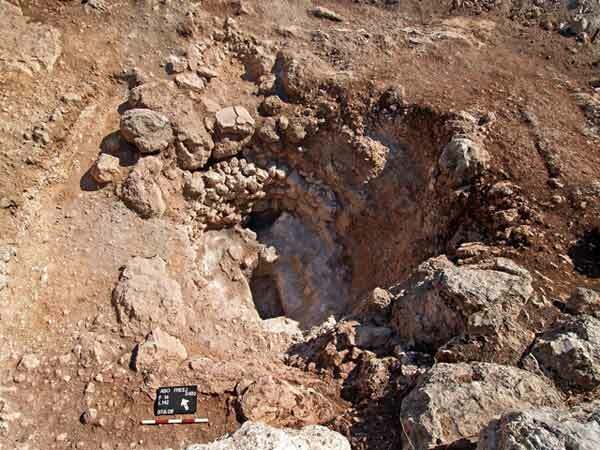 200904–1005/646860–7010), prior to construction southwest of Highway 443.The excavation, undertaken on behalf of the Israel Antiquities Authority and underwritten by the Ministry of Construction and Housing, was directed by D. Masarwa, with the assistance of the late S. Ya‘aqov-Jam (administration), H. Lev-Ari (GPS), B. Antin and M. Kunin (surveying and drafting) and S. Ammami (photography). 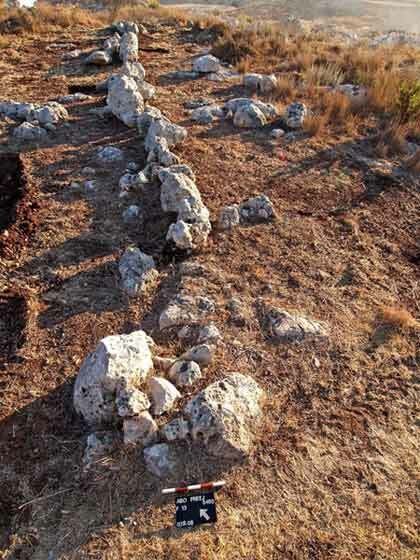 The excavation area, on the northwestern slopes of Khirbat Abu Fureij, is situated in a region of rocky hills with pockets of arable soil alongside bedrock terraces. The site had been surveyed and excavated in the past (ESI 20:68*–69*; HA-ESI 111:102*–103*; 114:60*; HA-ESI 120; Permit Nos. A-4680, A-4786; License No. B-96/1997). Various installations, including limekilns, field towers, farming terraces, stone clearance heaps, some of which are surrounded by walls, dams in the wadi channels, winepresses, a cistern, cupmarks, a pit grave and a section of a road, were discovered. 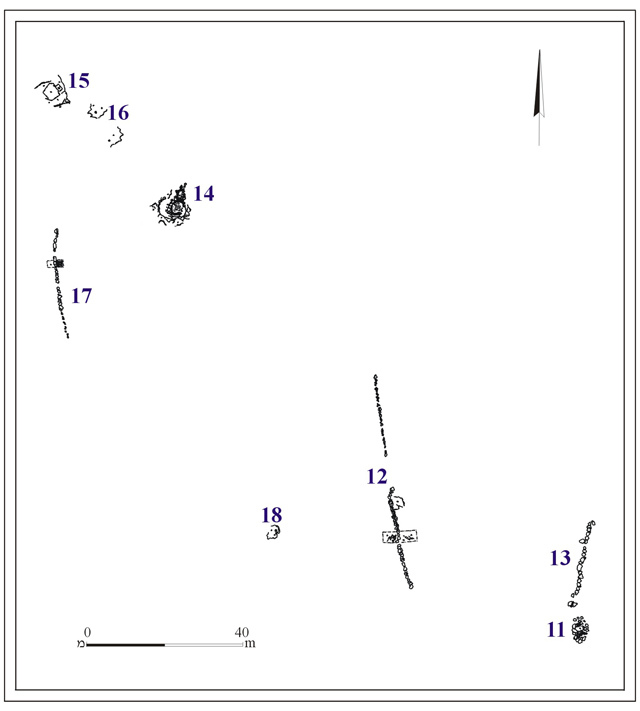 An area (15 dunam) was examined by means of mechanical equipment and eight installations were found, excavated and documented (Fig. 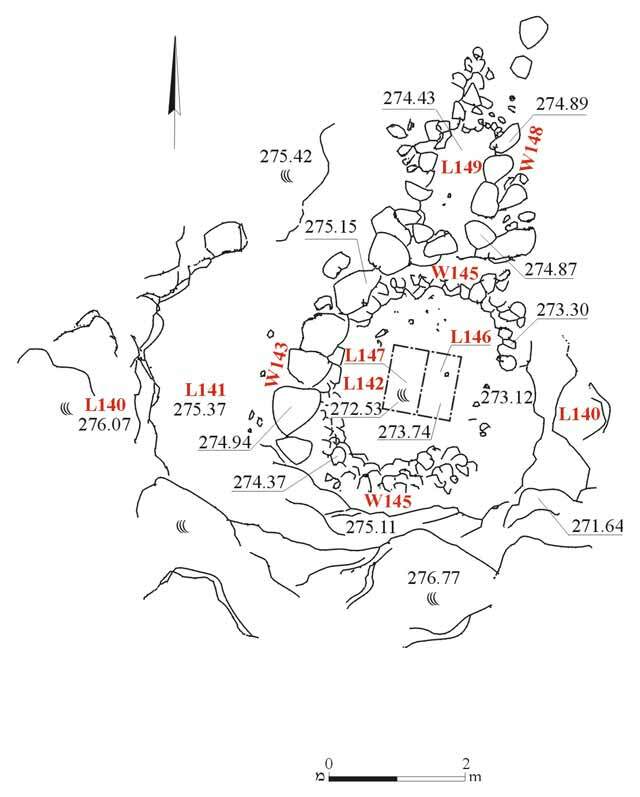 1), including a stone clearance heap (11), two walls delimiting cultivation plots (12, 13), a limekiln (14), a winepress (15), farming terrace retaining walls (17) and two pairs of cupmarks (16, 18). Stone Clearance Heap 11 (Fig. 2). An elliptical heap (diam. 3.5 m, height 0.3 m) was exposed in the southeastern part of the area. It consisted of medium and large stones that had been cleared and stacked up on top of a bedrock surface. The pile was surrounded by a wall (W111), built of a single course of large fieldstones, which was meant to prevent the stone clearance from sliding off the heap into the cultivated area. Enclosure Walls. Two north–south oriented walls, which delimited cultivation plots, were examined north and northwest of the stone clearance heap. 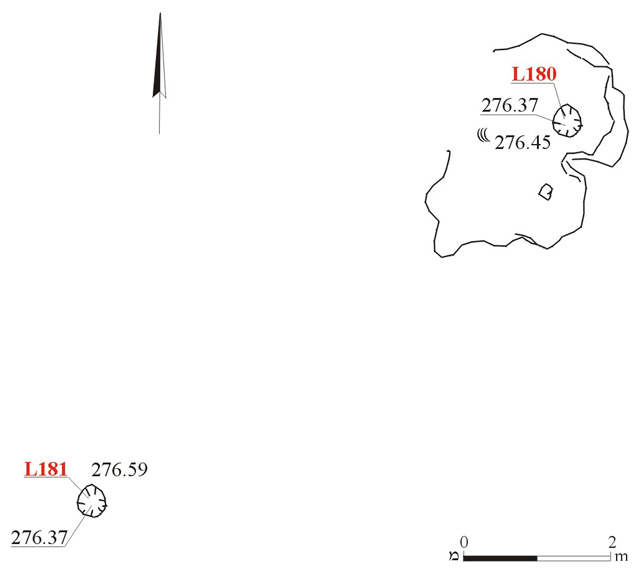 Wall 12 (length 80 m; only the southern end was drawn for a distance of 21 m; Fig. 3) and Wall 13 (length 40 m; only the southern end was drawn for a distance of 12 m; Figs. 2, 4). The walls were built of large stones, set on top of brown soil fill. Limekiln 14 (Figs. 5, 6). A circular pit (L142; diam. 3.5 m, depth 2 m) was found filled with medium and large stones.The bottom part of the pit was bedrock hewn and the upper part was built of large stones (W143), preserved two courses high. The rock-hewn sides (L145) were lined with uniform medium-sized stones (0.3×0.3 m), arranged in neat, six courses high rows. The lining was meant to protect bedrock from the fire during the manufacturing process of lime. A thick layer of lime (L146; thickness c. 0.4 m) was revealed beneath the stones that filled the pit.A probe (1 sq m) excavated to the bottom of the pit ascertained that the layer of lime covered a layer of ash, which rested on the bottom of the installation (L147; thickness c. 0.3 m). The ash was the remains of wood, which burned at the bottom of the pit to convert the stones into lime. A heap of lime stones (L149) to the north of the limekiln was presumably meant to be used as raw material in the installation.A wall (W148) that adjoined the northern side of the kiln was uncovered below the heap. The wall, oriented north–south, was built of medium-sized stones, and probably served as a retaining wall for the northern side of the kiln, whose firebox did not survive. Winepress 15 (Figs. 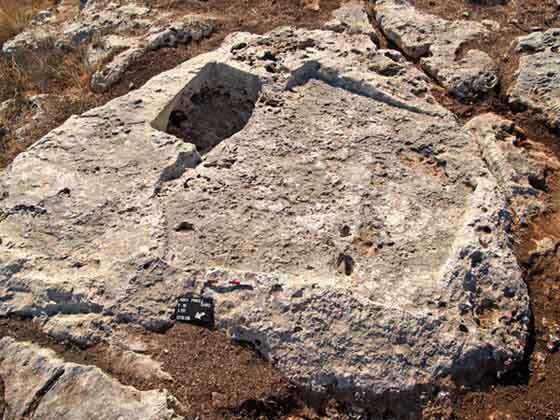 7, 8) wasa small installation, coarsely hewn in hard limestone bedrock.The trapezoidal treading floor (L151; 2.8×2.8 m) utilized the exposed bedrock surface to the utmost.The floor sloped gently to the north, toward the collecting vat (L152; 0.9×1.3 m, depth 0.5 m), in whose floor a round sump (L153; diam. 0.7 m, depth 0.25 m) was hewn. Farming Terrace 17 (Fig. 9). A retaining wall (W170) of a farming terrace, oriented north–south and built of two courses of medium and large fieldstones, was exposed on a natural bedrock terrace. Another wall (W173), built of medium stones, rested up against the eastern side of W170 and supported it. The two walls together retained a farming terrace that extended to their west. Cupmarks. Two pairs of round cupmarks (diam. 0.17–0.34 m, max. 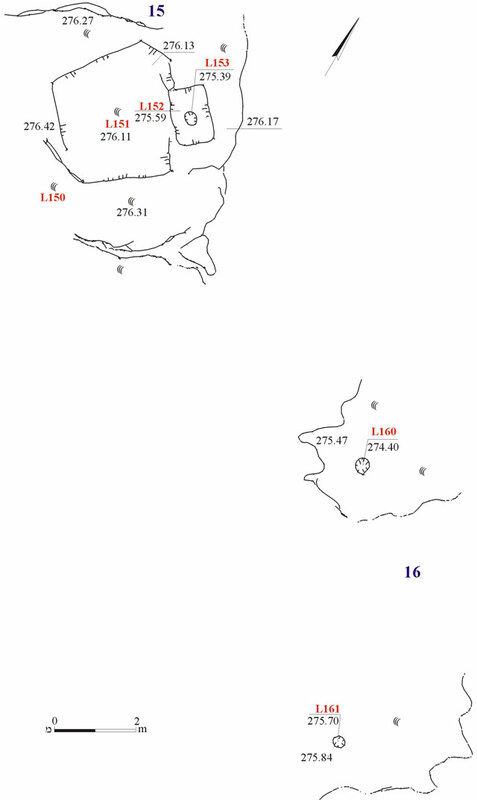 depth 0.12 m) were hewn on two bedrock surfaces, one in the northwestern part of the examined area (16; see Fig. 7) and the other in the southern part (No. 18; Fig. 10).It is unclear what the function of the shallow cupmarks was and when they were hewn. They could have been used in conjunction with milling, grinding or extracting liquids. A very small number of worn and non-diagnostic potsherds was found in and around the installations, which join others from previous excavations and surveys in the region and attest to agricultural activity that included viticulture and wine production.Since no other remains were found in the mechanically dug probe trenches, it seems that this region was used for farming and belonged to one of the sites located to east, Khirbat Abu Fureij or Horbat Tittora. 1. General plan of the installations. 2. Stone Clearance Heap 11 and Wall 13, plan. 4. Wall 13, looking northeast. 6. Limekiln 14, looking north. 7. Winepress 15 and a pair of cupmarks (16), plan. 8. Winepress 15, looking east. 9. Farming Terrace 17, plan. 10. Pair of cupmarks (18), plan.